Maine forest rangers seek safety in a sidearm — but do they need it? 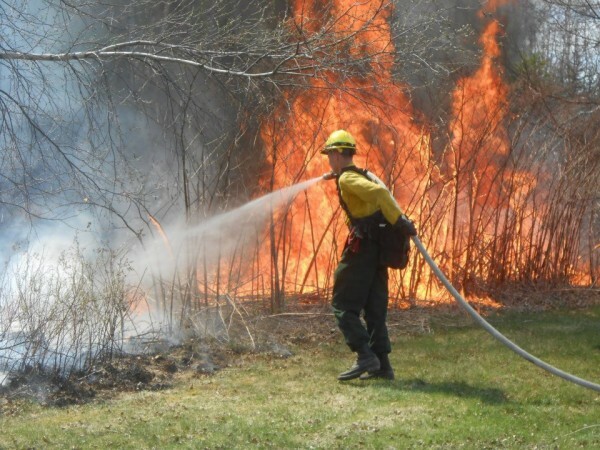 A Maine Forest Ranger uses a fire hose to douse a fire with high flame lengths earlier this year. He is wearing all of the protective gear issued to a Maine Forest Ranger, including Nomex fire-resistant pants and shirt, leather boots and gloves, a hard hat, eye protection, a portable radio and a backpack containing a fire shelter. 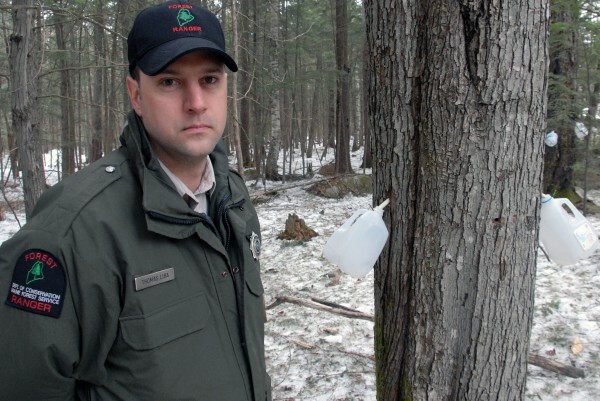 Maine Forest Ranger Thomas Liba stands in woods near an illegal maple syrup operation in the Katahdin region in March. Bill Greaves knows how quickly things can go bad for a Maine Forest Ranger. In 1989, Greaves, now the regional forest ranger in Ashland, responded with a sheriff’s deputy to a call that nearly cost him his life. Upon arriving at a home in the Washington County town of Crawford, a man came outside and opened fire. Greaves was shot in the groin. The deputy was cut by flying glass when a bullet hit their vehicle. After a seven-hour standoff, a state police tactical team entered the home and overpowered the man, who was lying on a bed, holding a gun. “It turned out this was a trap and we were the targets,” Greaves said. Greaves was not carrying a firearm. On-duty rangers are not allowed to carry a sidearm. Today, rangers are only permitted to carry pepper spray and handcuffs. 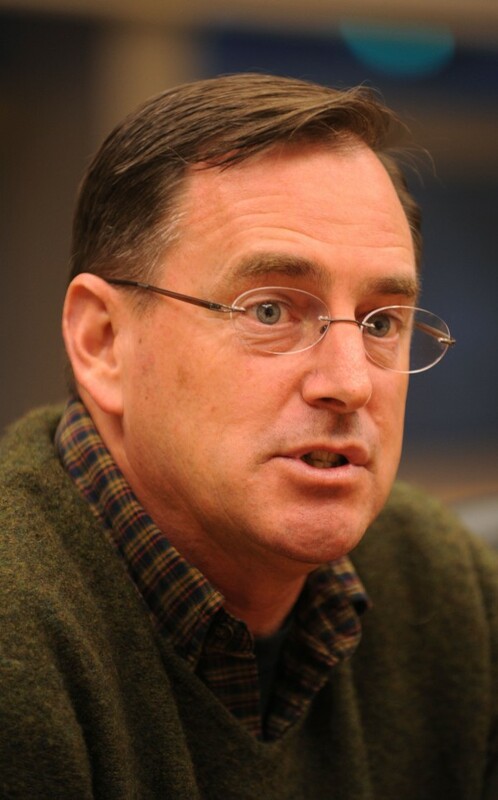 In the wake of Greaves’ shooting, a bill was introduced in the Maine Legislature proposing to arm the state’s forest rangers. After some political wrangling, present rangers say, that bill was defeated. Earlier this year, another bill sought the same thing: Arm the rangers. That bill, LD 297, seemed destined for passage despite opposition from landowners and the Maine Forest Products Council, which represents Maine’s $8 billion timber industry. Gov. Paul LePage then convened a task force to study the issue and see whether efficiencies could be gained with Maine’s other natural resources law enforcement agencies — the Warden Service and Marine Patrol. A legislative committee supports t he bill, but now the proposal has slowed as legislators seek to clarify who will pay the $142,000 to $2.1 million needed to train and arm rangers. And while the bill’s future is uncertain, one thing is not: The state’s forest rangers feel they would be safer if they were armed. In the 24 years since he was shot, Greaves said he has never again found himself in a situation where he thinks he would have even drawn a weapon. But he also thinks things could have turned out differently in 1989 if he had been armed and properly trained with a gun. What does a ranger do? Maine’s forest rangers are often misunderstood. They’re sometimes mistaken for game wardens. They’re often asked where the best fishing is. And even those who recognize them as forest rangers think that all rangers do is fight wildfires. Forest rangers are law enforcement officers. Maine has 74 ranger positions, including supervisors. Seven jobs currently are vacant, leaving 67 uniformed rangers across the state. 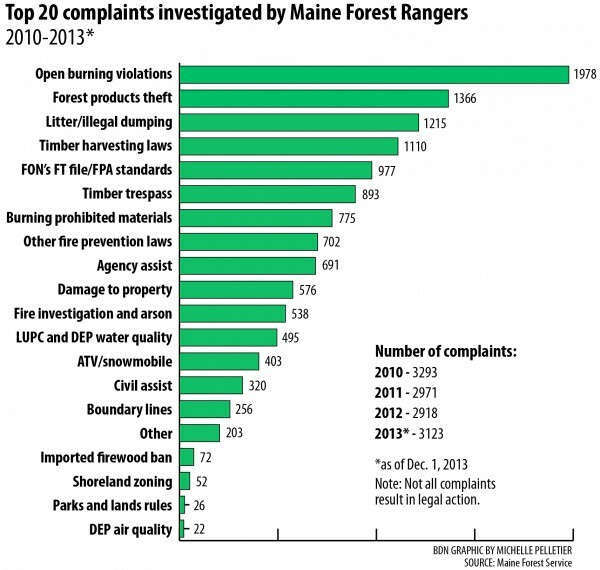 And while fighting wildfires draws the most attention, firefighting and arson investigations are just 11th on a list of the top 20 complaints investigated by rangers from 2010 through 2013. Topping the list is open burning violations, followed by theft of forest products and violations of timber harvesting laws. Ranger responsibilities also change with the seasons. During the spring, attention often turns to forest road complaints, and then the first round of wildfires, as well as educational programs designed to prevent those fires. During the summer and through the fall, rangers continue to monitor logging operations, as well as watch for and fight fires. And throughout the year, rangers investigate timber theft and timber trespass complaints. Timber theft may involve taking one or two trees from someone else’s land, or a clear cut that covers dozens of acres. Timber trespass takes place when someone cuts someone else’s trees but does not take them, as often happens when hunters clear shooting lanes in front of a tree stand. A vast majority of the time, according to Nelson, those rangers are working on their own. Departmental policy says rangers are expected to avoid hazardous situations. If a person is confrontational, they should retreat. If an arrest is needed, which is only allowed in “extreme cases,” they are encouraged to call state police, sheriffs or local police to make it. But help isn’t always immediately available and rangers often work in remote locations. As Nelson points out, no ranger knows what he or she is going to find on any given stop, even if they’re just checking paperwork at a logging operation. “There’s a lot of uncertainty,” Nelson said. • 2009: In Saco, a ranger came upon two people, one of whom was holding an axe and refused repeated commands to drop the axe. • 1999: In Sagadahoc County, a ranger walked down railroad tracks to investigate a nighttime fire. Shots were fired, and the ranger dove off the tracks. A person began running toward him, but got tangled and subdued by the ranger. And rangers can encounter hostility even when they’re not dealing with people face to face. Chief ranger pilot John Crowley, who learned to fly helicopters in the U.S. Marine Corps, said a disgruntled man called airport personnel when he flew his helicopter over the man’s property. The man threatened to shoot down the helicopter if it flew over his land again. Crowley said that the three other states with similar forest ranger models to Maine — New Hampshire, New York and South Carolina — each arm their rangers. Crowley is among those rangers who have worked to get legislators to support LD 297, and he says he knows sticking his neck out on policy issues may place him on the radar of highly ranked officials. The Maine Forest Service, of which the rangers are a part, have traditionally opposed arming the rangers. The current forest service head, State Forester Doug Denico, was president of the Maine Forest Products Council before taking his present post. The Maine Forest Products Council has been the most vocal opponent of LD 297. Repeated requests for comment from Denico were unsuccessful for this article. Denico’s boss, Department of Agriculture, Conservation and Forestry Commissioner Walter E. Whitcomb, did issue a statement on the proposal. The state’s large forest landowners are lobbying against the bill, fearing that arming rangers would lead to “mission creep” and a change in ranger priorities. Crowley said rangers know what their duties are, and are not looking to expand their mission. Being armed, he said, would just help make rangers safer. And Crowley said his military background has emboldened him in his quest to arm his fellow rangers.